Don’t you just love creative commons licensed images? In this case the story behind the image in a paper on hybrid vigor, another subject close to the heart of any biologist who has ever worked with corn, although this group worked with snapdragon, a species that is used as a model system for flower morphology. 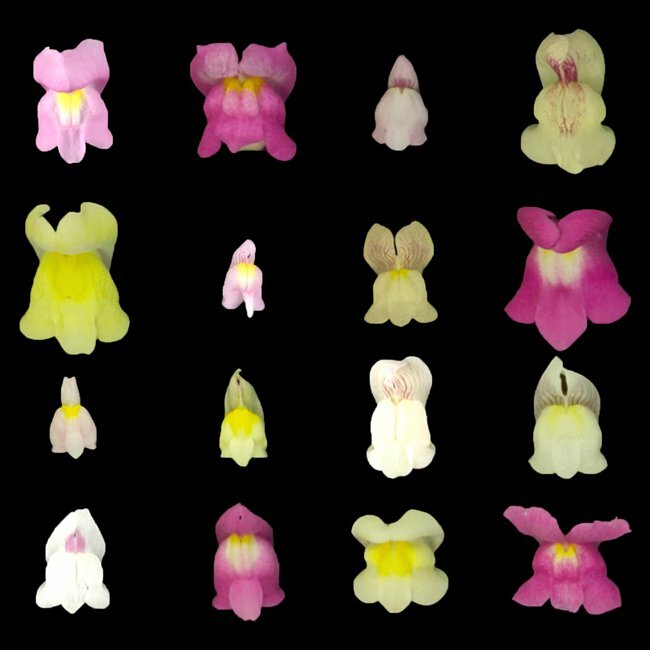 Snapdragon flowers are interesting genetically because they are only symmetric along one axis. The genes behind this trait have been studied for quite some time and have names like Cycloidea, Radialis and Divaricata. <– Snapdragon folks generally come up with classier sounding names for their genes than the communities for many other model species. 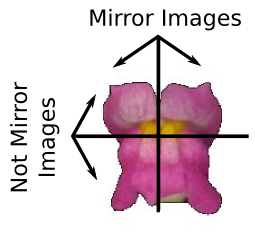 Snapdragon flowers can be symmetrically folder over one axis, but not the other. (Modified from the image above). The authors of this paper found that the expression* of a number of these genes varied between different species within the snapdragon genus (Antirrhinum). So far so good, but the really exciting bit of this paper is that the authors use the version of these genes from different species (with significantly different levels of expression) to show that while the changes in expression observed between different species don’t make much of a difference to the final shape of snapdragon flowers, being stuck with a low expression version of a gene to begin with means a snapdragon plant has a much more altered shape when one of the copies of that gene is completely broken. Usually versions of genes which don’t work (called null alleles) don’t cause any problems as long as the other copy of the same gene (remember plants, like animals, receive two copies of their entire genome, one from each parent) is still working normally**. What the authors of this paper have shown is that, while the proteins these genes contain instructions for are able to function normally at different concentrations, outside of that range, problems quickly develop. Which is all well and good but how does that tie back into hybrid vigor? Let’s switch over to a hypothetical gene. The figure below shows an incredibly simplified graph of gene expression. On the left side is expression so low, the plant can’t compensate and Bad Things Happen. On the right side is extremely high expression of the gene, which can also result in Bad Things. But in the middle there is a green box, marking a whole range of expressions where the plant is able to develop and reproduce normally. Different species, and different individuals within species can express this gene at different levels without significant impacts on their fitness (ability to survive and reproduce). The paper points out that there is likely a peak value for fitness (shown by the dark green bar in my graph). Small changes in expression for individual genes within the larger light green box don’t create big enough problems to be acted on by natural selection, but the effect of bringing thousands of genes**** closer to that peak of fitness at once is going to result in a significantly more healthy and vigorous corn plant (or whatever your favorite organism is). The other key point that occurred to me is that the ideal level of gene expression is a moving target. Changes in temperature, water availability, salt stress, day length, insect attacks, fungus attacks, competition from neighboring plants, availability of nitrogen and other nutrients in the soil, and hundreds of other things are going to change what the “best” gene expression level is. 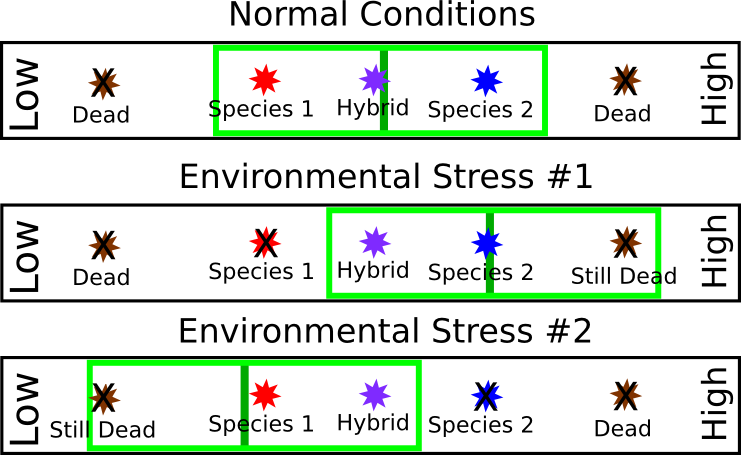 If the ability of the plant to compensate for gene expression being less than ideal is constant, that means being close to the center of the range under ideal conditions gives the best shot at avoiding falling out of the green box entirely into Bad Things Happen Here territory under a wide range of environmental stresses that shift ideal expression one way or the other. Highly simplified graph. Dark Green Bar: Optimal expression Light Green Box: Range of expression where the plant can mostly compensate. This was one of those papers where half the reason I wanted to write about it was to better organize my own understanding of the arguments being made. I am not a population geneticist by any stretch of the imagination, so please let me know if parts of this make no sense. This is one of a number of proposed explanations for hybrid vigor. While this paper has some really cool data, it would describe it as suggestive rather than conclusive. *Throughout this post I’m going to be talking about gene expression, which is a term familiar to most biologists, but maybe not to the general public. The genes contained within the DNA of your cells make RNA copies that code for the proteins that do the work of keeping you alive. Some genes will make many more RNA copies (and therefore more protein) than others, with the result that the proteins those genes contain the instructions for are much more common within your cells. For example your cells probably need a lot more protein copies devoted to breaking down food to produce energy, and relatively fewer copies of proteins that proof-read your DNA to catch mistakes made in copying it. The amount of protein a specific gene produces can vary in time (from night to day or from childhood to adulthood), in space (your cells in your liver with produce different amounts of individual proteins than your skin cells), and from individual to individual and species to species. **If both parents contribute broken copies of the same gene, the result is more likely to be interesting changes that give clues about what role the gene plays when it is working correctly. ***There are plenty of situations in which this assumption will be false. This paper is awesome. Lots of great ideas. Made me pick up a primer on pop-gen.